You can support our efforts in establishing and improving protected areas by signing up as a Direct Debit Donor. If you prefer to spend your money and have fun at the same time, why not visit our project sites? 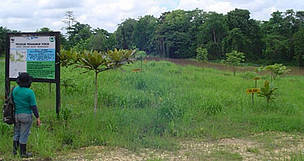 Visits to all three of our project sites can be arranged through qualified nature tour operators. By visiting these areas, you will be contributing to the local economy. More importantly, you will help to prove that protected areas can generate income for the state governments without the need to exploit our natural resources unsustainably. Are you a forest manager or timber products processor? If you are interested in a sustainable business, why not sign up as a participant of Malaysia Forest and Trade Network (MFTN) today? Your commitment will be the stepping stone for your company to achieve market recognition and enjoy the full support of WWF as a responsible producer. For responsible consumers, be aware of and ask about the source of timber products you intend to buy; do not buy from unsustainable sources and those that are not well managed. Support forest certification by choosing only certified products. Credible forest certification promises and delivers on well managed forests from the environmental, social and economic aspects. Only sustainable forestry provides a greener future for our next generation and generations to come. As the end-user, you can discuss your concerns with timber product retailers and make a difference. Together we can contribute to better forest management in Malaysia while enjoying the benefits of using sustainable forest resources. Restore & the Kinabatangan - Corridor of Life initiatives welcome oil palm plantation companies and private land owners to join in the efforts being undertaken to reforest the ‘Corridor of Life’ in the Kinabatangan Floodplain. Working together, we can provide the technical support needed by private landowners to reforest or rehabilitate this area. At present, WWF-Malaysia has two Memorandums of Understanding (MoU) with oil palm plantations in the Kinabatangan; Borneo Samudera Sdn Bhd and Asiatic Development Berhad. With the MoU, efforts are being made to return parts of the oil palm land back to natural forest to provide a ‘Corridor of Life’ for wildlife within the area.